On December 1, 2013, Metro-North Railroad on the Hudson Line derailed near the Spuyten Duyvil station in the New York City borough of the Bronx. Newport Beach train accident attorneys remember that the derailment caused the death of four passengers, as well as injuries to 61 passengers out of the 115 on board. After extensive investigations, the leader of the National Transportation Safety Board (NTSB) found that the most direct cause of the accident was the engineer’s inattentiveness as the train entered a curve which required the engineer to slow the train down to three times the speed the train was actually going. NTSB also found that the engineer suffered from sleep apnea, hampering the engineer’s ability to adjust to the morning shift he began two weeks earlier. NTSB faulted both Metro-North for not screening its employees for sleep disorders and the Federal Railroad Administration (FRA) for not requiring railroads to do such screenings. NTSB also found that the accident could have been prevented had positive train control (PTC) been installed. The FRA also required Metro-North to install additional safety measures. Trains are colossal. Newport Beach train accident attorneys know that when trains collide, derail, or get involved in any accident, their devastating force becomes catastrophic. A crashing train takes on a life of its own, becoming virtually unstoppable and unmanageable. Passengers are powerless to prevent the carnage from occurring and are often tossed around inside the carriages, breaking bones and suffering internal injuries. There are several different types of trains. Trains are more commonly powered by electricity, steam, diesel fuel, and less commonly, horses, rope or wire, gravity, pneumatics, batteries, or gas turbines. Trains can be used to transport cargo (freight trains) or people (passenger trains). There are light rails, which are usually smaller commuter trains, to express trains, running in excess of 100 mph. Trains can be either below or above ground. Derailment: when the train runs off its track. Causes of derailment include mechanical failures, obstruction on the tracks, poor and improper maintenance of tracks, improper operation of points or improper observance of signals protecting them, sudden braking while the train is traveling at a high speed (express trains may travel in excess of 150 mph), improper switch alignment, failing to install adequate signals (e.g., lights and gates), defective train parts, excessive speed of trains in poor weather conditions, etc. Head-on collision: when two trains collide. This usually occurs when trains are sharing the same railroad tracks and there are miscommunications about the location of the trains. The most notable head-on collision, and the worst train accident in United States history, occurred in 1918, when No. 1 and No. 4 trains collided at the “Dutchman’s Curve” near present-day Belle Meade, Tennessee. The cause of the accident was determined to be the fault of the No. 4 train crew and tower operators, all of whom failed to properly account for the presence of the No. 1 train on the same line as the No. 4 train. Railroad crossing accidents: occurs when a vehicle is crossing the railroad tracks while there is an oncoming train. This may occur due to defective railroad crossing signals, lack of railroad crossing signals, or motor vehicle driver error. Accidents involving pedestrians: occurs when a person tries to cross the railroad tracks while there is an approaching train. If the conductor/engineer sees the pedestrian and tries to apply the emergency brakes while traveling at a high rate of speed, this could also cause the train to derail. Fires: fires may occur on trains if, for example, the fuel tank blows. This can cause devastating fatalities because the train becomes an inferno. Newport Beach train accident lawyers recalled that on February 20, 2002, a gas cylinder exploded in the fifth carriage of the Al Ayyat Train in Egypt, resulting in 383 or more casualties and deaths. Other accidents: other collisions involving multiple trains may occur if there is a stalled train on the railroad tracks and an active train crashes into the stalled train. This could occur due to miscommunication, faulty brakes, or other defective train parts. Outside forces could cause train accidents. For example, 1989 saw the deadliest railway accident in Soviet history when the LPG pipeline had a leak causing a massive amount of propane gas to settle in a gully between the towns of Asha and Ufa. When two passenger trains passed each other in this area, the sparks created by the trains ignited the highly flammable cloud and resulted in a massive explosion, decimating both trains. Sabotage: although rare, train accidents could be caused by sabotage: tampering of the train itself, railroad tracks, or even use of weaponry such as bombs (2004 Madrid train bombings). Other causes: overworked and tired train crews, improper training of train crews, understaffed track maintenance departments, etc. 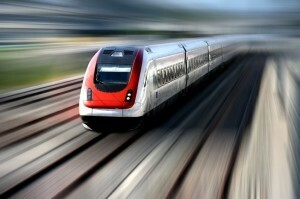 Determining who is responsible for the injuries of a victim of a train accident may require extensive investigations. There could be multiple factors that contributed to and/or caused the accident. Newport Beach train accident lawyers will not only look at the train crew but will also investigate the train company to determine whether all laws and safety precautions were taken. For more information, contact Newport Beach train accident attorneys with Russell & Lazarus APC at (949) 851-0222.